In 1962, The Manchurian Candidate, a film of considerable significance, released. It was quite the exciting Cold War thriller. Many filmgoers, critics and columnists thought it prophetic and, today, it seems so. • He was programmed to kill. 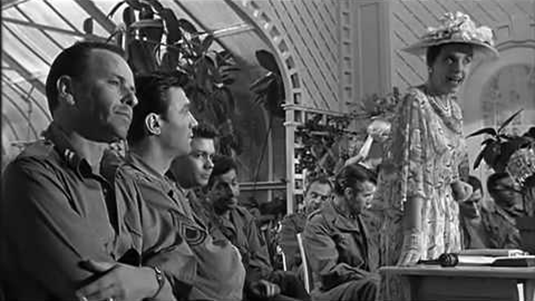 Briefly, The Manchurian Candidate, which starred Frank Sinatra and Laurence Harvey, is the story of a Korean War veteran that turns out to have been brainwashed by the communists. He is the perfect killer. Then he gets an American handler to help him carry out a political assassination. His handler is his mother, Eleanor Iselin, portrayed by Angela Lansbury; she received an Oscar™ nomination for her performance. In public, she is a staunch anti-communist and her husband, John Iselin, the stepfather of the candidate, is a US Senator, no less. Yes, it’s quite the Cold War version of Game of Thrones. At one point, the mother meets with chief rival of her husband, Senator Jordan. She asks Jordon if he’ll oppose her husband being put forth at the upcoming presidential convention for the vice presidency slot. He makes it quite clear that he would most definitely oppose such a move. As Jordon so eloquently puts it, John Iselin couldn’t be more of a threat to America if he was a paid operative of the Soviet Union. This is ironic, as, essentially, he is a Soviet operative. Although the film never explicitly states he’s an agent, Eleanor is a Soviet agent; she is the power beyond the throne, in their marriage. Recently, I thought of that movie and that scene when I saw the actions of Donald Trump. I don’t like to use the term, traitor, in describing a person, especially when that person sits in the White House, but, in these circumstances, I’m afraid it’s appropriate. Here are those words; Donald Trump is a traitor. Now, as I said, do not like using that word, but I no longer have any doubts. The man has done everything in his power to destroy our cherished institutions: Congress, the Presidency itself, the FBI, the CIA and, most important, the free press and our ability to vote and elect the members of our government. Just recently, he even attacked Fox News, the network that has been a virtual propaganda tool for his entire administration. Fox, perhaps surprisingly, reciprocated. It questioned some Trump actions. If that doesn’t give one cause to pause, I don’t think anything will. • Trump tries to destroy NATO. North Atlantic Treaty Organization (NATO) has been a stalwart defender not merely of Western Europe, but almost everything that makes the western value emphasis and the very foundations of our world and cultures worth preserving. Trump has almost single-handedly destroyed all of our western alliances. At the same time, he embraced not just Putin, but also Kim and other dictators. When it comes to the basic workings of our government and institutions, Trump has damaged them as well. The recent shutdown has had a horrible effect on many basic government departments and cost the economy eleven billions unrecoverable dollars. His tax cut, which is a massive giveaway to the rich, has brought the government to its knees; for the second year in a row, US government must borrow a trillion dollars, to keep going. This not only bleeds our government of money, but also creates a terrible financial burden for our children, grandchildren and no one knows how many more generations. Indictments handed down and guilty pleas to crimes entered by Trump administration as well as business associates link them to activities involving Russians. The New York Times recently reported one hundred or more such contacts by eight Trump associates, in and out of government; that number is sure to grow. • Does America have the strength to overcome the actions of Trump? The final report from Mueller is yet to drop. My position is this: whether or not Trump is an agent of Russia or is controlled or blackmailed by them is no longer relevant. As Senator Jordan might put it, Donald Trump couldn’t be more of a threat to America if he was a paid operative of Russia. I only hope we have the strength to overcome his actions.